You can easily add both free and/or pay tickets to your events. Event tickets integrate seamlessly with our Stripe integration for card payments, making it easy for people to pay for events quickly and securely online, and for you to manage your sign-ups intuitively. You can also specify a ticket price but set the ticket to be Pay on arrival, so that when signing up for the event, no payment processing takes place, but the sign-up will be saved and confirmed by email. Through the event check-in system, you're able to mark a "pay on arrival" sign-up as having paid at the point of check-in. To add tickets to an event, go to "Calendar" > "Events", select an event (or create a new event). Click Edit event and scroll down to the Tickets tab. You'll need Administrator or manage module permissions for the Calendar module in order to be able to edit an event and add tickets. Click Add ticket. Give your ticket a Name - perhaps "Adult", or "Family", add any optional ticket Description, perhaps details of what the ticket includes. Optionally enter a range of dates when your tickets are to be On Sale (available). Using different ranges of dates for different tickets you can, for example, offer early bird incentives and standard rate tickets. The Pay on arrival? option allows you to specify a ticket price so that when people sign-up for the event, no payment processing takes place, but the sign-up will be saved and confirmed by email. If you're using the event check-in system at your event, you'll be able to mark a sign-up as having paid at the point of check-in. Optionally set a ticket Quantity, perhaps based on your event/venue capacity. You can also specify a maximum total tickets for your event, which can be used in conjunction with ticket-level quantities to ensure you don't oversell one particular ticket type or don't oversell your event! As people sign-up for your event, a ticket Quantity progress indicator on the event page in ChurchSuite will change, giving you a simple visual alert to the number of tickets sold. Once all of a particular ticket have been taken, no further sign-ups for that ticket are possible, although it is always possible for a user to add manual sign-ups beyond a ticket capacity from within the event page in the Calendar module. Importantly, you have the option to create multiple ticket "types" for an event - perhaps with different prices to reflect your different event sign-up options. To create pay tickets, simply enter the price in the Price field. Prices are always in your local ChurchSuite account currency. Provided you have set up your Stripe integration correctly (see the related support article below), and where pay on arrival is not checked, those signing up from your event page will be able to pay directly for their tickets online. 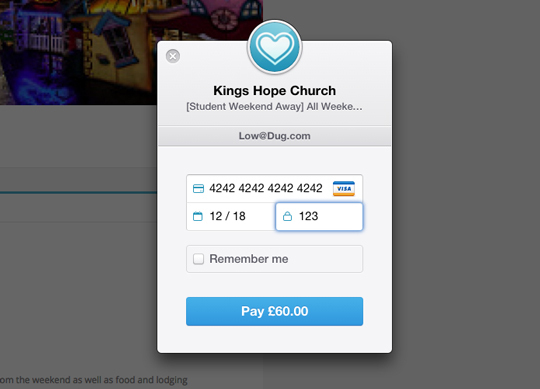 Ticket sales through Stripe are subject to their standard charity rate transaction fees, currently 2.2% + 20p for UK churches with charity pricing, comprising 1.2% + 20p to Stripe and 1% to ChurchSuite - Stripe deduct transaction fee at source and the net ticket proceeds are deposited in your church's bank account. It's not currently possible to create a pay ticket payable in instalments. To create free tickets simply leave the price field empty or set the ticket price to "0.00". Only active tickets will be visible on the public-facing event sign-up page. However, you might create "inactive" tickets, perhaps for internal sign-ups that can only be manually added by a user in the Calendar module. It's possible to create Hidden tickets (which need to be active to be distributed!). 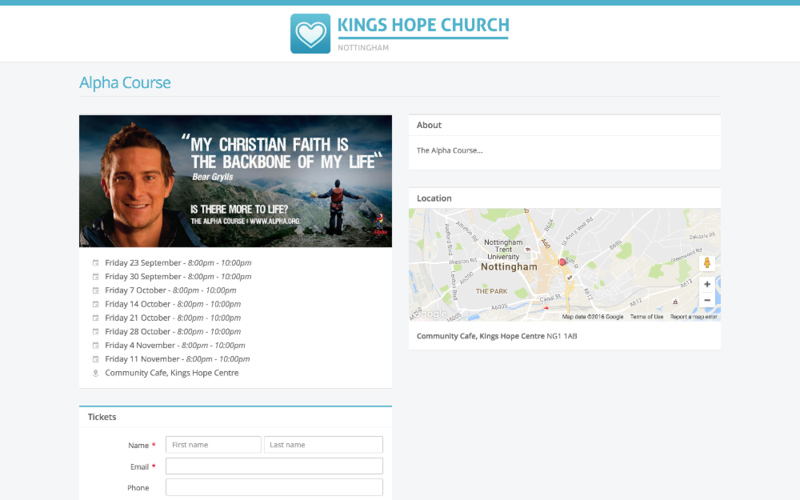 Hidden tickets are not visible on the normal event sign-up form that you might make visible in My ChurchSuite, Embed and Connect, allowing you to distribute a discreet private link to just selected people. That private link takes the person to a modified sign-up page that includes just the ticket options you specify, including any hidden tickets you wish to show. Having set a ticket as Hidden and having saved your event, you then have the option to Create private link - available on the 'action cog' on the right hand side of each ticket in the list. You can send a private link for any active tickets, whether hidden or not. Selecting Create private link from any ticket will pop-up a ticket with defaults pre-selected based on the ticket cog that you clicked 'Create private link' from. Tick each of the tickets you would like to privately show - a unique URL is generated for that ticket combination. You can also Preview the event page to check it will show the correct tickets. You can then copy and paste the private link in to your communications. In this example, we're creating a private link for just the team ticket, which is a hidden ticket that we'll share with just those being invited to serve. ChurchSuite's event management functionality gives you lots of flexibility when setting up your events and adding tickets. To enable this sign-up feature, simply tick the "Sign up to the sequence" option in the 'Sign-Up' options. Remember, the default setting is sign-up to a date, so you must select 'Sign up to the sequence' before saving your event! Note that this option is only displayed if the "Event repeats?" option is selected. "Event repeats?" allows you to specify each of the dates in event sequence. Now, when your multi-date sequence event is saved, no matter which date in the sequence you view in the Calendar module, you'll be able to view all the sign-ups for the sequence. Also, the event sign-up page will show all future dates remaining in the series, so your potential sign-ups can easily see that they're signing up to a series, rather than needing to sign up to each individual date. Importantly, the iCal file, attached automatically to the sign-up confirmation email, includes all the future dates in the series when the sign-up clicks 'Add to calendar'. Even though a ticket that is listed as inactive is not be visible to people signing up for an event, you can still use it from within ChurchSuite when manually signing up individuals - perhaps to allocate people a free "team" place in exchange for their volunteering - simply create a free or discounted 'team ticket', but leave the ticket status "inactive". Now you can manually add team sign-ups with a free/discounted ticket. Once you've set up your active tickets, people will be able to pay for them directly by card from your event page. They simply select the relevant ticket, answer any event questions you may have specified, and fill in their contact details. After this they click 'Proceed' and then 'Pay by card'. Remember to set your event visibility if your want to allow event sign-up through My ChurchSuite or your web-embedded calendar. For guidance on this, see the related articles below. You can also enhance the sign-up experience for people by including event questions and creating a customised sign-up confirmation email. The sign-up confirmation email automatically includes a .ics attachment allowing the sign-up to easily add the event to their personal calendar application. Both these features will help you greatly with event management, ensuring you have all the information you need in one place, whilst keeping everyone in the loop. See the related articles for both these features.